The other day Ben and his class went to the Esplanade for a short excursion. 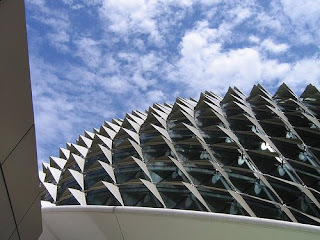 The Esplanade is Singapore's premier performing arts centre, and an architectural icon. Once they were there they were taken on a tour of the building, and the kids were able to see the different performance spaces, including the Concert Hall and the Theatre. The teachers made the visit into an exercise in looking for patterns, which they have been learning about in the classroom. What a perfect place to think about patterns. The exterior of the esplanade is one huge geometric pattern, with the aluminum cladding designed to shield the glass underneath forming a beautiful pattern of interconnecting triangles. It is such a distinct design and really does resemble a giant pineapple or durian fruit. The children also found patterns in the theatre and concert hall with the seats, lights, curtain, railings and sets. This is a fun game to play with small children almost anywhere. It could keep kids amused in the car or airplane or even in the supermarket. They can also make patterns with blocks and shapes. 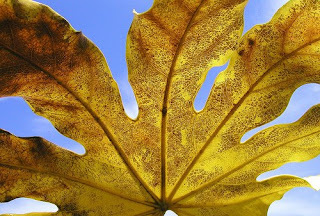 Some of the most beautiful patterns are found in the natural world, so visit the Botanical Gardens and look closely at the flowers and plants. Understanding patterns is a basic skill for further mathematics and will help the children go on to more difficult problem solving. There are patterns everywhere, so make a game out of it and explore the world around us.